Paul Has Measles is a children's book about viruses and vaccines available in English (download link) Spanish (download link) French (download link) German (download link) and Portuguese (download link). I’ve never spoken to Francis Collins, who heads the National Institutes of Health. He comes across as a decent, caring man, and by all accounts he is. That’s certainly how he came across in his remarks earlier this month at the NIH’s meeting on ME/CFS research. But anyone who runs the NIH must play politics as well as direct the country’s medical research enterprise. And there are obviously differences of opinion as to whether the current limits on NIH funding for ME/CFS arise because of scientific concerns or the politics of the illness. The government claims the first. The patient/advocacy community disputes that argument, and so do scientists investigating the illness. At the NIH meeting, Arthur Mirin, a retired mathematician whose daughter has been ill for years, said the disease burden for ME/CFS should lead to spending in the range of $200 million a year. And Cornell’s Maureen Hanson, who is an NIH grantee, made a passionate appeal from the podium for more funding. After listening to Dr Collins’ presentation, Jennie Spotila provided her usual sharp, smart insights. As she wrote last week on her blog, Occupy M.E., his remarks gave her a sense of deja-vu. I am reposting Jennie’s blog below, with her permission. Subsets, the promise of new technologies, and new ideas. Dr. Collins hit all these same notes in his 2019 remarks. Hey folks! As of now I am at 71% of my goal, with eight days to go. So far I have exactly 700 donations. It would be great to get closer to 1000, as in previous years. Today, Erica Verillo has generously offered to match any donations made through this Friday–up to a total of $5000. I have so far raised $67,800. So if you’ve been holding off on donating, now’s the time! Make your donation work double! If I raise an additional $5000 more this week, Erica’s $5000 matching gift will bring me much closer to my goal. It goes without saying that I am very touched and humbled by the enormous support I have already received. Thanks to all who have donated and those who will do so before the end of the crowdfunding! I want to continue to do what I can so that people suffering from this terrible disease finally get the help and care they have always deserved. After Reuters ran that PACE/CBT/GET propaganda piece last month, I sent an e-mail expressing two concerns to Kate Kelland, the reporter, and the two editors listed as having worked on the story. The first concern was that the story falsely said I published my investigation on the blog of a Berkeley colleague. 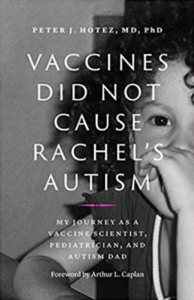 Since Kelland had sent a list of questions about my work to Professor Racaniello, the host of Virology Blog and a Columbia professor, she knew this wasn’t the case. Given that, I assumed the misstatement was an accident–the kind of stupid screw-up that’s really easy to do. All journalists have been there. When we are born, our blood contains antibodies that we have inherited from our mothers. They are transferred across the placenta and provide protection from infection until IgG production begins around 15 weeks after birth. Can we exploit such antibody transfer by vaccinating pregnant mothers to protect newborns against infectious diseases that occur early after birth? At least in mice infected with herpes simplex virus, the answer is yes. Neonatal infections with herpes simplex viruses, which occur by virus transmission from the mother during childbirth or in the early postnatal period, can have serious consequences, including disseminated disease or encephalitis in half of infected newborns. Even when treated with antiviral drugs, such infections can lead to neurological deficits. Mothers who have antibodies to herpes simplex viruses are less likely to transmit infections to babies than mothers who have been recently infected. The difference is due to the transfer of maternal IgG antibody to the fetus, which protects against infection. Furthermore, neutralizing antibodies to herpes simplex viruses 1 and 2 are effectively transferred from mother to fetus. In mice, passive transfer of serum from immunized mice to pregnant mice prevented lethal disease after inoculation of pups with herpes simplex virus. These observations suggest that immunization of pregnant women with a herpes simplex virus vaccine might protect offspring from serious infections. To test this idea, pregnant mice were immunized by intramuscular inoculation with a replication-defective herpes simplex virus 2. 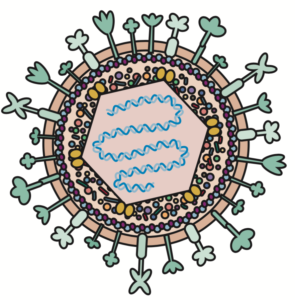 Both dams and offspring had antibodies to multiple viral proteins in serum as well as in the trigeminal ganglia – the site of herpes simplex virus latency. When challenged with lethal doses of herpes simplex virus 1 or 2, pups born to immunized dams had reduced virus in the central nervous system and survived. In contrast, pups born to unimmunized dams succumbed to infection. Because neonatal herpes simplex virus infections can have neurological consequences, mice were subjected to the open field test to measure anxiety-like behavior. Offspring of uninfected dams challenged with a low dose of herpes simplex virus 1 showed thigmotaxis, a tendency to remain close to the walls of the mouse cage. In contrast, offspring of infected dams showed normal behavior after infection. These observations show that even a low dose of herpes simplex virus can cause abnormal behavior in mice, which can be prevented by immunization of dams. These findings suggest that other neonatal infectious diseases, which occur too early in life to be stopped by immunization, might be prevented by immunizing the pregnant mother. Besides herpes simplex virus infections, acquired at birth or shortly thereafter, this approach might also be applicable to prevent respiratory syncytial virus infections, which typically occur in the first few months of life. In addition, maternal immunization against viruses acquired in utero by transplacental passage of virus from mother to fetus – including cytomegalovirus and Zika virus – might also be of benefit to the fetus. As the authors write, the maternal virome is likely an important determinant of human health. Thanks, Mom. Last Sunday, I sent a letter expressing my concerns about Kate Kelland’s recent article to the appropriate person–the Reuters global editor for ethics and standards. After considering the issues, Reuters has decided to add my current academic title to the post and leave everything else as is. I appreciate the first decision and obviously disagree strongly with the second. I note that the story still refers to me, for some reason, as a “former journalist.” This is false. I am both a currently working journalist and a public health investigator. For some reason, Reuters has determined it is impossible to be both.